Clinical guidelines (CGs) contain a set of directions or principles to assist the healthcare practitioner with patient care decisions about appropriate diagnostic, therapeutic, or other clinical procedures for specific clinical circumstances. It is widely accepted that the adoption of guideline-execution engines in daily practice would improve the patient care, by standardising the care procedures. Guideline-based systems constitute part of a knowledge-based decision support system in order to deliver the right knowledge to the right people in the right form at the right time. The automation of the guideline execution process is a basic step towards its widespread use in medical centres. To achieve this general goal, different topics should be tackled, such as the acquisition of clinical guidelines, its formal verification, and finally its execution. 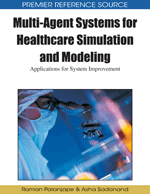 This chapter focuses on the execution of CGs and describes the design and implementation of an agent-based platform in which the actors involved in health care coordinate their activities to perform the complex task of guideline enactment. In electronic healthcare (e-Health) it is increasingly necessary to develop computerised applications to support people involved in providing basic medical care, reducing costs and providing relevant patient information at the point of care (Lenz, et al., 2007; Wyatt & Sullivan, 2007). A clinical guideline (in the following, CG) is a highly matured therapeutic plan that compiles optimum practices for treating patients in a well-defined medical syntax. Thus, the adoption of CGs is a promising way for standardising and improving health care practices (Field & Lohr, 1990; Mersmann & Dojat, 2004; Michie & Johnston, 2004). More concretely, CGs are a set of directions or principles to assist the health care practitioner with patient care decisions about appropriate diagnostic, therapeutic, or other clinical procedures for specific clinical circumstances. CGs are developed by government agencies, institutions, organizations such as professional societies or governing boards, or by the convening of expert panels. They provide a foundation for assessing and evaluating the quality and effectiveness of health care in terms of measuring improved health, reduction of variation in services or procedures performed, and reduction of variation in outcomes of health care delivered (CancerWEB, 2008).